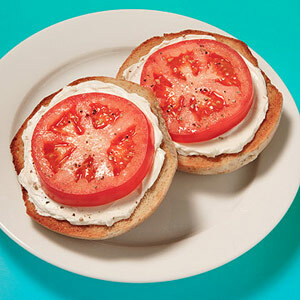 Toast bagel halves and spread with cream cheese. Top each side with a slice of tomato and season with salt and pepper. PER SERVING: 302 cal., 7 g total fat (4 g sat. fat), 52 g carb. (8 g fiber), 13 g pro.